Cause and Effect | Tennessee Aircraft Services, Inc. 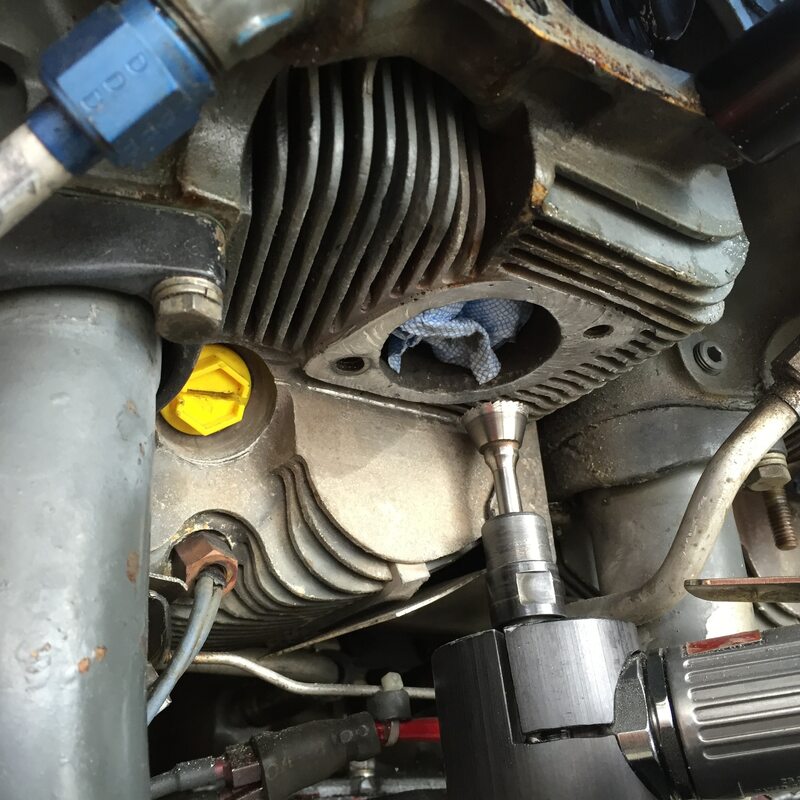 I spend a fair amount of time reading engine data and have found there is a relatively small set of common symptoms that present an even smaller set of common problems. For instance, when EGT rises and CHT, falls the standard answer is failed spark plug. Or, if EGT and CHT both fall dramatically, it’s likely restricted fuel flow through the injector nozzle with a confirming increase in fuel pressure but reduction in fuel flow. A CHT rise with no other corroborating data is almost always caused by ineffective baffle material. However, there are times when standard answers just won’t fit the questions. It’s no news that metals expand and contract with temperature changes, and different metals react at different rates and to differing extremes. Engine designers have a pretty good idea how to deal with attaching parts of different materials together to make a single component like a cylinder. Things get really interesting when we start the engine and add combustion pressures and vibrations to the mix. There’s so much movement at the tops of the cylinders, they can’t be easily be attached to each other. 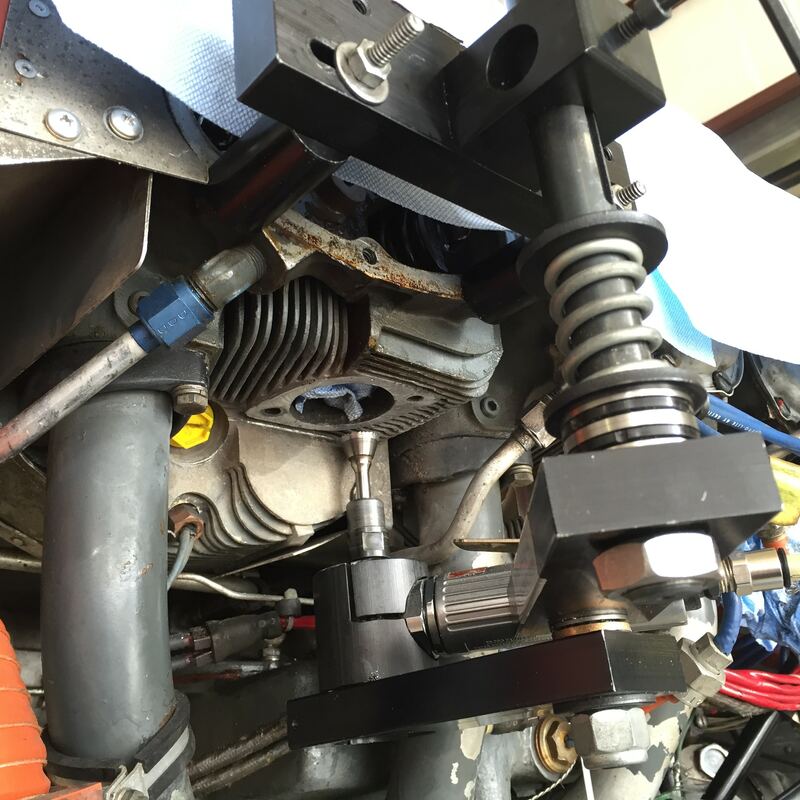 The next time you’re looking in the engine compartment of your Cessna, you might note that the metal cooling baffles on adjoining cylinders aren’t directly bolted together. There are slip joints in the baffles to allow for cylinder movement. The very flexible silicone baffle material is usually the only direct link from one cylinder head to the next except for the exhaust pipes. A typical automobile engine has all the cylinders cut from one solid block of cast iron, steel or aluminum and surrounded by a water jacket. This keeps everything running at the same temperature and limits all the independence of our air cooled aircraft engine cylinders. For that reason, automotive exhaust systems are just as solid and inflexible as the rest of the engine they’re attached to. In contrast, a Cessna engine requires an exhaust that’ll move with the cylinders and still tolerate some pretty extreme temperatures. Almost all aircraft exhaust systems are constructed using some form of thin stainless steel or Inconel alloy tubing. These materials offer strength, heat resistance, corrosion resistance, minimal weight and some amount of flexibility. Most systems incorporate one or more “slip joints” to help with thermal expansion and contraction allowances. As one might assume, all this moving around at high pressures and high temperatures must create havoc in several places. One of these trouble spots is the aluminum cylinder head exhaust port where the stainless, or inconel, exhaust pipe attaches. Of particular issue is keeping a good seal at this mating surface. The Lycoming exhaust stack flange mounts to the cylinder by two or three nuts on studs screwed into the cylinder head. With so few mounting points, it is difficult to keep proper contact pressure all the way around the gasket. As a result, when the engine is under power, the heat and pressure inside the exhaust pipes eventually find or create an exit where there shouldn’t be one. When the seal is breached, the high pressure 1300+ degree F gasses escape in a focused blast reminiscent of a torch. The aim of this torch determines how long it takes to gain someone’s attention. Targets include the intake tube where it can preheat the induction air to that cylinder. Another might be the valve cover oil return line. The target that got our attention this time is the CHT probe. When heat from an exhaust leak hits a CHT probe, the displayed CHT increases with no corresponding change in the EGT or any other engine indication. If noticed early enough, this indication “error” can alert an owner to take action that can save significant damage to the cylinder and avoid major engine surgery. Routine visual inspections of the cylinders around the exhaust port are an excellent early warning tool as well. Exhaust leaks will present as a white dusting on surrounding surfaces. If the leak has enough time, it will burn the paint off the cylinder and just leave an area of bare aluminum. If an exhaust leak is caught early enough, the solution is simply cleaning the cylinder port mating surface, clean the exhaust pipe flange and installing a new gasket. The problem arises if the leak has time to damage the cylinder surface enough to require refacing it. There are several tools on the market that can resurface minor damage on exhaust ports. I’ve not tried them all, so this discussion isn’t intended to be any sort of product review. The tool we use, and is shown in the accompanying pictures, is one of the first units on the market and is pretty old. It still does a good job, though. A little effort on the internet will locate other possibly newer and better tools. Getting good access to the port is the most difficult part of the job. The very fact that an exhaust leak is found raises the likelihood that one or more of the exhaust studs has rusted. Much of the other exhaust hardware is probably rusted from the normal exposure to heat and moisture. One can expect to have some hardware that’ll need to be cut off. The worst is an exhaust stud that breaks off, requiring special effort and tools to extract the remains. Regardless of which tool is used, it will bolt onto the cylinder head in such a way that it will be properly aligned with the port. The cutting blades of the tools can be adjusted to cut small amounts of the port so only enough is removed to recreate a good surface for the gasket. The question that eventually comes up is how much cutting is too much? The general guidance from Lycoming on cutting the exhaust ports can be found in the Direct Drive Overhaul Manual part number 60294-7-7 on page 6-20 paragraph 6-112 which states in its entirety: “Warped Exhaust Flanges. 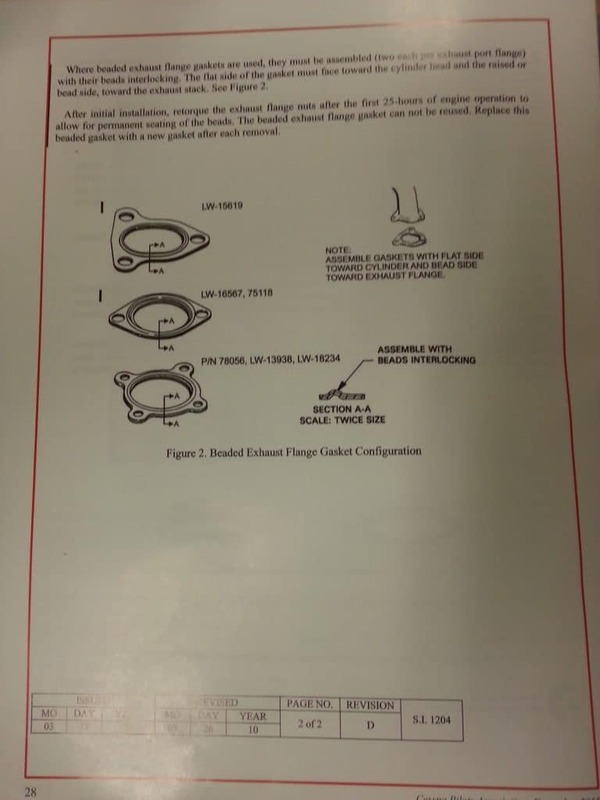 If a warped exhaust flange is noted, the flange should be straightened by grinding.” It’s pretty vague and short guidance, but that allows a mechanic to use some good common sense when doing this work. Our rule of thumb is the resurfaced exhaust flange must protrude above the cylinder cooling fins. Once cutting goes below that, some other sort of repair is called for. That also means removing the cylinder from the engine which is what we’re hoping to avoid. Once the flange is all cleaned up and inspected for cracks, it’s time to put everything back together. This is a good time to repaint any bare aluminum areas on the cylinder caused by the leak. Painting will help identify any new leaks that pop up later. New exhaust gaskets are used and should be the “no-blow” style. 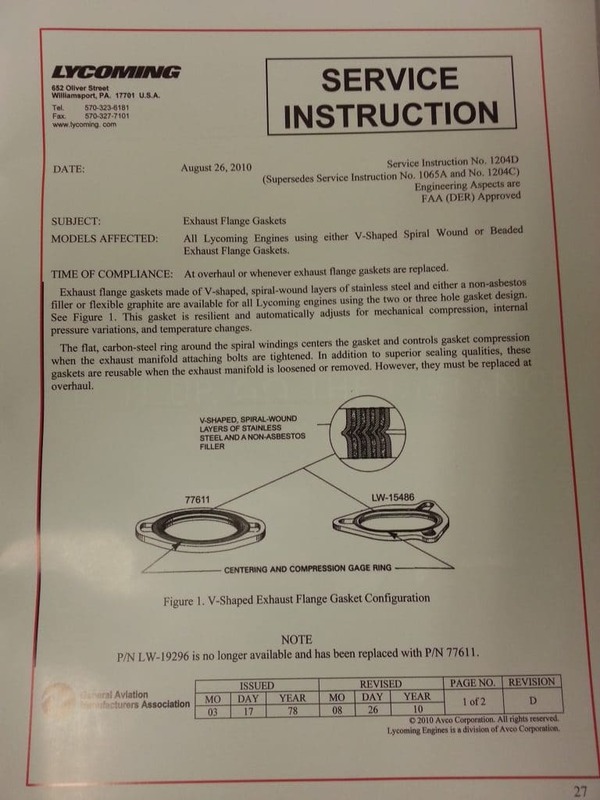 Lycoming Service Instruction 1204D explains the details of these as well as the older beaded style flange gaskets. Vigilance in monitoring the health of an airplane is a continuous effort. Knowing what to watch for and where to watch for it is a matter of continuous education. A keen eye on the engine monitor is a good early detection tool to use between cowling removals. A detailed look at all the cylinders anytime the cowling is off will almost certainly find an exhaust leak before it has time to become a threat. As with any maintenance issue, early detection is key to safety and reliability. Saving money as a result is just icing on the cake.